Today I went to my Crochet Group at my church. We were all lucky today because we were all given a big supply of new yarn to work with to make knitting and crochet projects. We are allowed to make whatever we want for the year because our group gives knit & crochet items to hospitals, the poor or homeless and we also have every year a Christmas fair. There are 17 people in our group and not everyone shows up each week because some people just work from home. Last week I was the only one who came, but we usually all meet in the morning every Tuesday and then go out to lunch afterwards. It is fun and we all keep each other inspired. Last week I made a crocheted Infinity Scarf in just 2 sittings. It was fun, quick and easy to make. I have posted the design that I made up myself. 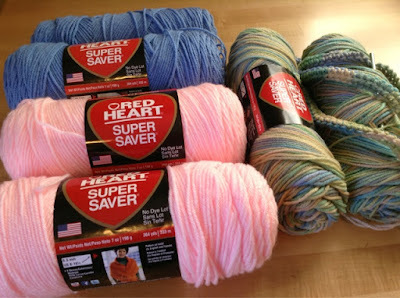 This is a picture of the yarn I got to make some projects. We do not use fancy yarn for this type of crochet group that I belong to, but the yarn is good for baby blankets and baby sets, scarves, hats, hand warmers or cell phone covers. I belong to another knitting group that I met from Ravelry. In this group we all use better yarn and make whatever we want for ourselves or for other people. It is a fun group and over the weekend one of the ladies in the group decided to have everyone over for a knitting party. We each brought something to eat and there were all different types of picky food. There was a group of 10 of us and I managed to finish crocheting an Infinity Scarf! It made me happy that I was able to sit and crochet and have a good time. I have a lot of yarn friends. Yay for yarn! Thank you Chel you are so sweet and yes I do love both of my groups each week and it helps to keep me inspired to crochet/knit. I love knitting with big needles also it makes the projects go fast. Good luck with the Mother's Day present and I'd love to see the finished project.